I decided I would take this opportunity to blog while the kids are being babysat by the TV at the moment. Morgans Birthday was over a month ago and I am now getting around to blogging about it. 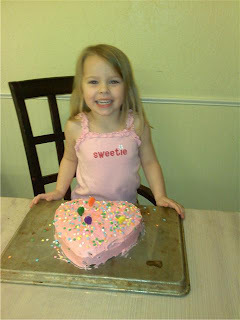 My little Princess is now 4. For her birthday, we just kept it simple. We opened presents, had cake and ice cream, went to McDonald's and let the kids play on the play land and then we let the kids stay up late and we watched "Tinker Bell" (for the 90th time). It was very simple, but Morgan had fun. Morgan got a memory game from her Grandma and Grandpa S. She loves it, and I am amazed and how good she it at it. She has an incredible memory. Grandma C. made her a twirly skirt that she wears all the time. Any time the radio is on and she wants to dance she has to have one of her twirly skirts on. I realize that her hair and clothes are different in each picture, but don't let that fool you, they were taken the same day, in fact it was only about 5 minutes apart. *She loves to be the "Princess"
*She loves doing school work of any kind. *She loves to draw/color/stamp/paint/cut/trace. 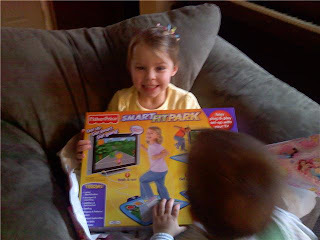 . .
*She is a super big sister, always looking out for David and Sierra. Don't worry, she doesn't let David get away with anything. *She is so loving, she always make sure you know how much she loves you! And we sure love her. Oh sweet! She must be just like her mother at the same age. Always changing outfits and dancing around in a twirly skirt!